A mansion allegedly belonging to a former Chief of Air Staff, Air Marshal Mohammed Umar (retd) has been sealed off by the Economic and Financial Crimes Commission. 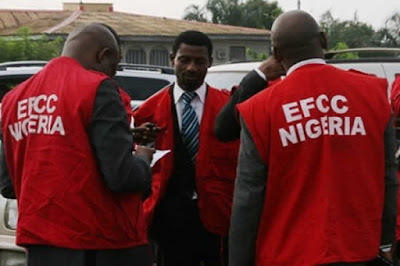 Punch reports that their correspondent, who visited the house located on 1853 Deng Xiano Ping Street, off Mahathir Mohammed Street, Asokoro Extension, Abuja, observed stickers bearing the EFCC logo pasted on the gate. According to the EFCC, the house is worth about N860m. “while being the Chief of Air Staff, Nigerian Air Force, between March and April 2012, in Abuja, within the jurisdiction of the court did the accused (Umar) use the United States dollars equivalent of the sum of N860,000,000 (Eight hundred and sixty million naira) removed from the accounts of the Nigerian Air Force to purchase for yourself a property lying and situate at plot 1853 Deng Xiano Ping Street, off Mahathir Mohammed street, Asokoro extension Abuja.”The anti-graft agency had also alleged that Umar removed another N700m from the accounts of the NAF to purchase a property at 14, Vistula Close, off Panama Street, Maitama, Abuja, while N500m was removed from the accounts of the NAF to purchase a property comprising a four-bedroomed duplex at Road 3B, Street 2, Mabushi Ministers Hill, Abuja. However, their correspondent, who visited the Maitama and Mabushi mansions allegedly belonging to the retired officer, observed that the properties had not been sealed by the anti-graft agency. Security guards at the Mabushi mansion, however, confirmed that the property belonged to Umar. The ex-CAF, who was arraigned for an alleged N7bn scam, had denied all the allegations levelled against him. Meanwhile, Punch’s correspondent learnt on Saturday that there was tension within the Nigerian Navy as the EFCC commenced fresh investigations into the three arms of the Armed Forces. The Federal Ministry of Finance had on Thursday directed the anti-graft agency to investigate the payroll of the military. The ministry said the investigation followed revelations in the course of the trial of a former Chief of Defence Staff, retired Air Marshal Alex Badeh, at the Federal High Court, Abuja, that N558.2m was diverted monthly from the NAF accounts into private pockets. The EFCC had since January been investigating only the air force and the Nigerian Army. However, with the new directive, it means that the Nigerian Navy would be included in the EFCC probe. “We were investigating only the army and the air force because they were the ones given funds to fight Boko Haram. Since the battle has only been in the North-East where there is no piracy, the navy was not really involved in the arms deal and we therefore did not focus on them during investigations.